With the success of Collective, Boss Pizzeria and My Other Brother, part-owner Julian Moussi seemingly had the Camberwell shopping district all wrapped up. But Moussi obviously had other ideas, feeling there was room for one more of his on-trend cafes. 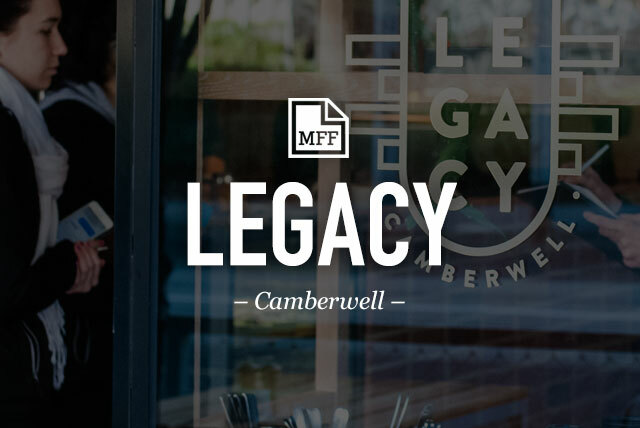 This time he’s partnered with Kristy-Lea Deva and Nicky Campbell (who doubles as executive chef) to open Legacy on Camberwell Road. Tucked into a small space on the ground floor of a new apartment complex, Legacy features wall-to-wall red brick accented with strip lighting. It’s certainly different to the warehouse meets Scandi-style of the moment, but is perhaps slightly claustrophobic, with the space feeling a little like a below-ground bunker. The menu is more health focused than Moussi’s other ventures, who is clearly pitching his food squarely at the trendy, lycra-clad brigade. 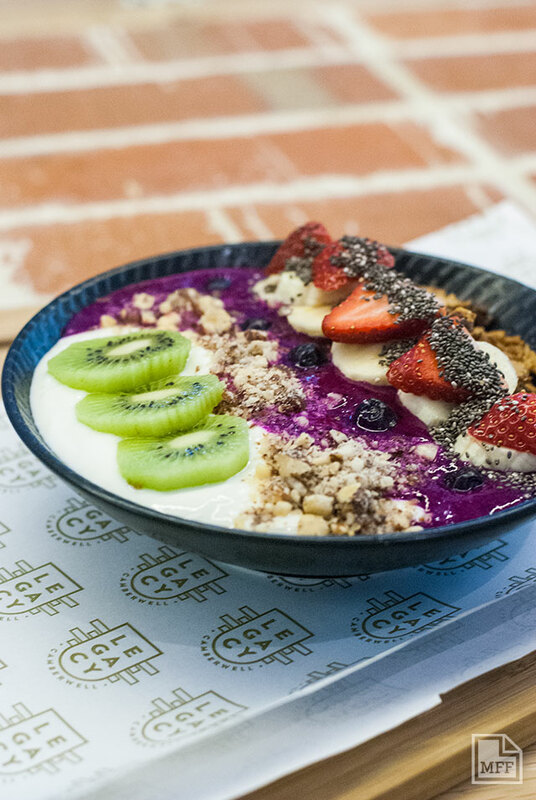 The menu features several ‘superfoods’, including the usual suspects such as kale, açai and chia. It’s also pretty as a picture, guaranteeing it will end up on social media to draw in the instagram crowd. 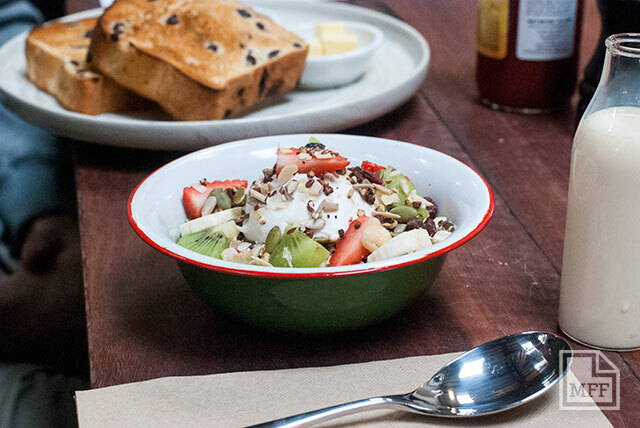 The granola, for example, is an artfully arranged bowl of fresh fruit, chia seeds, granola and yoghurt. But while it’s full of so-called ‘healthy’ ingredients, it’s a little on the sweet side. Obviously the term ‘health focused’ is used loosely. 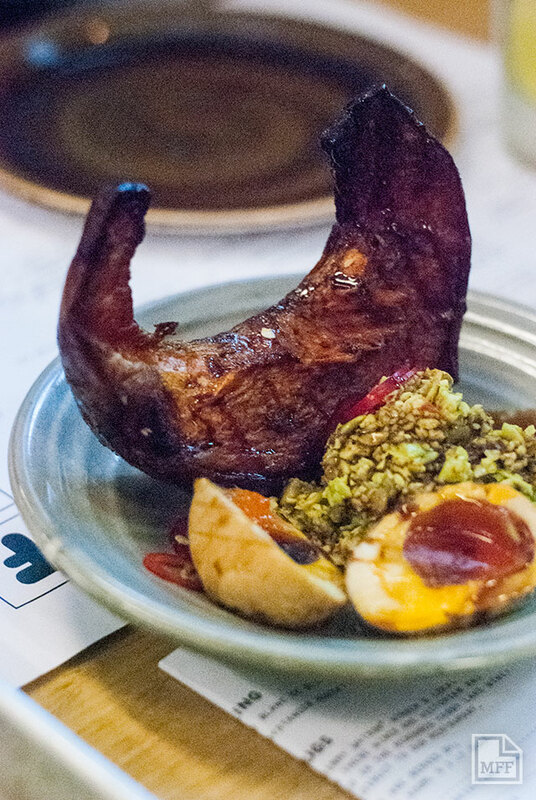 The is mainly made up of breakfast items, such as chia pudding, superfood porridge, and the ever popular smashed avo, plus a couple of lunch items including a fried buttermilk chicken bun. Can’t decide what you feel like? Why not try a bit of everything. 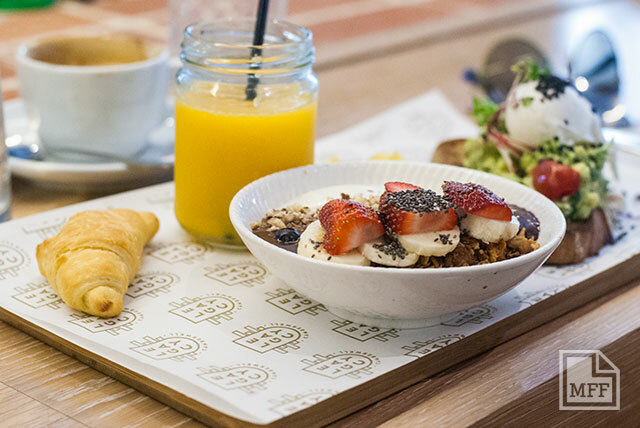 For the indecisive, there’s a breakfast option containing a smaller bowl of granola, a mini croissant, smashed avo on toast and an orange juice. 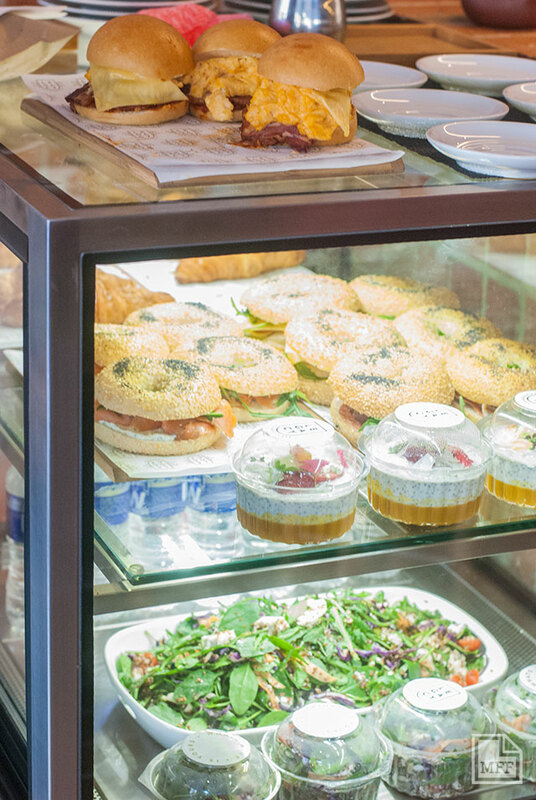 If you’re on the run, the counter at the front door contains a range of bagels, salads and other treats to keep you going. Grab one of their scrambled egg and bacon rolls with your morning latte, brewed from a custom blend from Dimattina. While the main menu does have a definite health bent, the sweet treats in the front window show these guys don’t take the superfood crap too seriously. 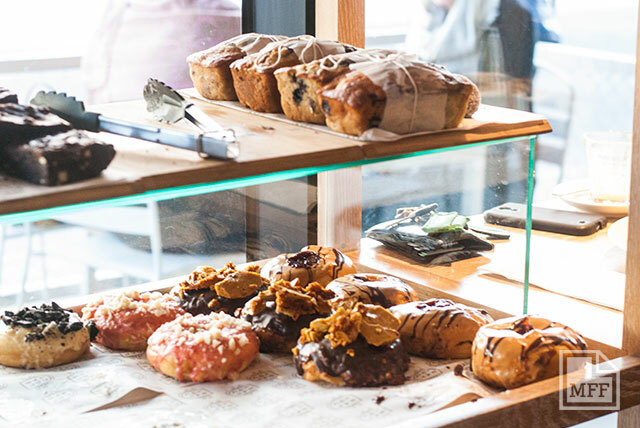 Most items are made in-house, including their signature range of doughnuts. While the menu may be more trend-driven than having any real nutritional merit, it is still darn tasty. From superfood porridge to fried buttermilk chicken, there’s plenty of options that appeal to a broad range of tastes. With two more cafes opening in the coming months in Glen Iris and Hughesdale, it seems certain Moussi’s legacy will be one of great food. If you’re a fan of bikes and booze then there’s an awesome event running this week just for you. 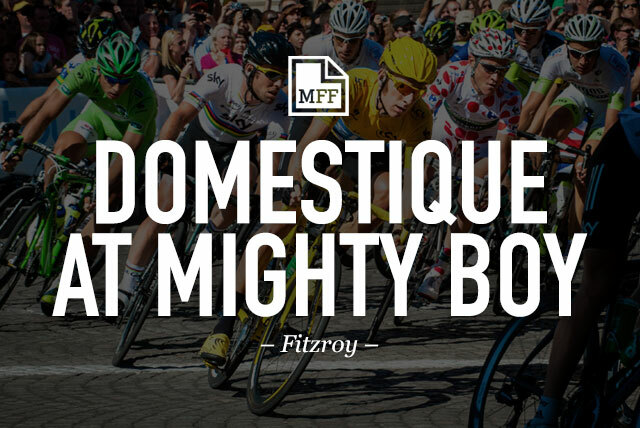 Shadow Electric has teamed up with Mighty Boy to bring you Domestique: a Tour de France pop up bar and eatery. Now in it’s fourth year, Domestique is live screening the tour this week at the Gertrude eatery, serving up some tasty snacks and drinks to keep you comfortable. Mighty Boy head chef Scott Blomfield (formerly of Supernormal) has put together a great menu for the five big stages. 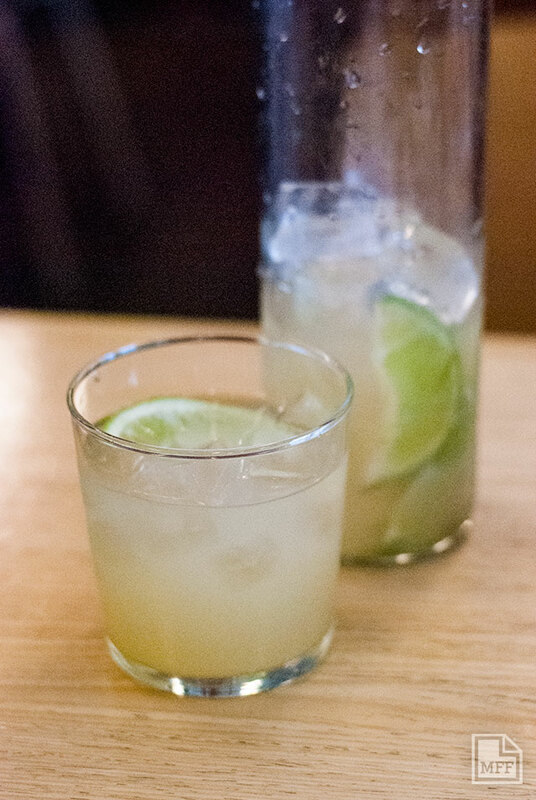 Cocktails, wine, beer and late night bar snacks will be available until the race’s end. For those who just happen by, the list of snacks includes Mighty Boy favorites fried eggplant bites, cauliflower kim chi and of course, there’s French fries. For bookings of 4 or more, there’s a set menu that stays true to Mighty Boy’s cuisine with a French twist. 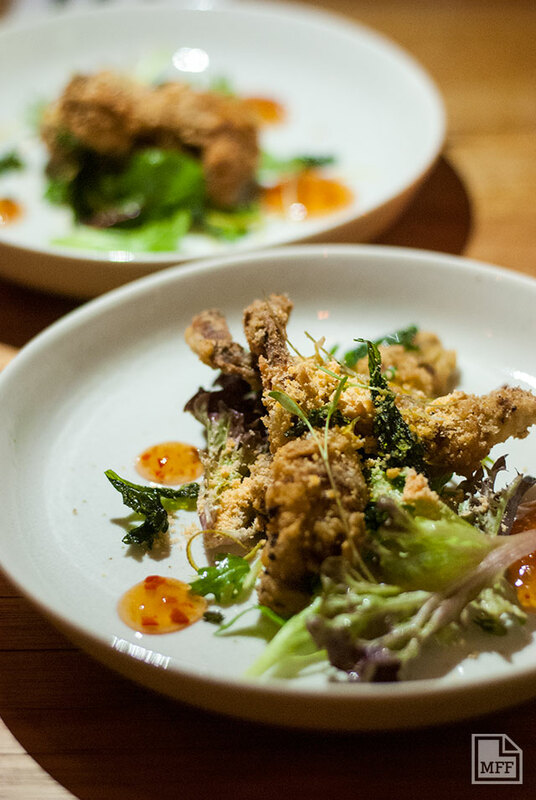 Start your meal off with some crispy frogs legs (yep, that’s right) or opt for chicken wings if you’re squeamish. 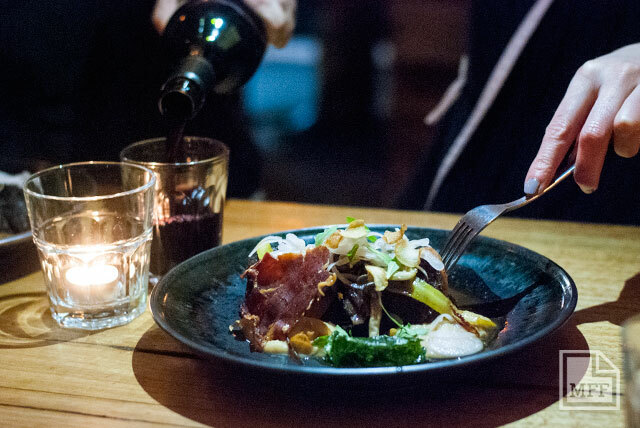 The main course is an Asian take on the classic Beef Bourguinon – beef cheeks braised in red wine and Asian spices, served with smoked kohirabi, pickled shallots, crispy jamon, mushrooms, and betal leaf crisps. 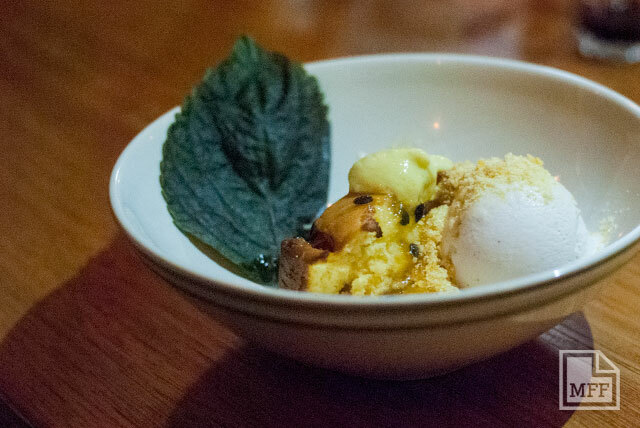 After a palate cleanser of green mango with chilli salt, comes a passionfruit pud served with crème brulee, coconut ice cream and sesame praline. It’s a delicious mix of flavours and textures that straddles the line between the two cuisines perfectly. If you’re a Tour tragic with a taste for food, this is one pop up worth a visit. Hurry though, as when the Tour ends on Sunday this pop up ends too. 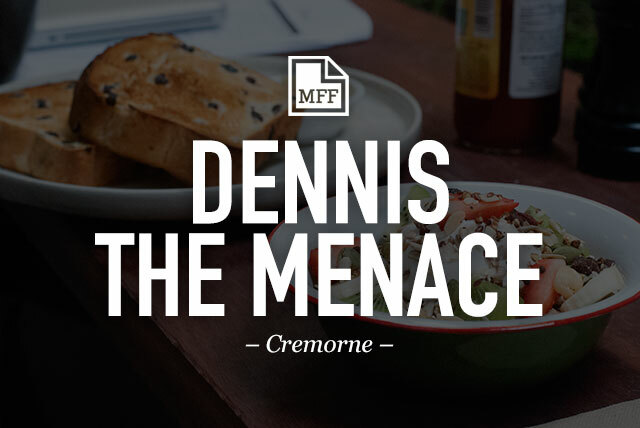 After the success of his Greville St cafe, St Edmonds, Adam Wilkinson has opened his second venture, Denis the Menace. Located in the back streets of Cremorne, this sustainably focused cafe evokes the playful feel of its namesake, while serving up some seriously good food. Converted from an old warehouse, the high ceilings and timber fit out give the space the feel of a kid’s treehouse. “Though designed thoughtfully, it was also playful, spurred on by character Denis the Menace. We pictured a boy building with his grandfather, armed with a twig sling shot and good intentions,” says eco-architect Simon Cookes of Duckbuild. Cookes has created an environmentally friendly space, complete with solar panels and salvaged timber cladding. Constructed entirely from materials collected from Wilkinson over time, diners may find themselves seated on apple crates fashioned into timber booths while sipping water from glasses made from recycled Carlton Draught bottles. Take a stroll out to their courtyard where you’ll also find Denis’ earthworms doing their bit for the environment. The extensive breakfast and lunch menus are highly original with a subtle health bent. Each dish has a fun name, such as the Big Green Good Fight ($14.00) – a mix of shredded kale, broccoli, avocado, buckwheat, pistachios and chilli served with a poached egg – or the Something Fishy Is Going On Here ($17.00) – hot smoked trout with pea puree, asparagus, avocado, spinach and kale, topped with a poached egg. Even the simpler items are presented with a little humor, such as the Fancy Toast ($8.00) which according to the menu is like regular toast except “someone accidentally spilled raisins and orange zest in the dough”. Or the One With Museli ($12.50) served a generous dollop of coconut yoghurt vanilla, strawberries, kiwi and banana with either water, soy or almond milk. But behind the cutesy names and playful attitude are dishes with a lot of thought and finesse. 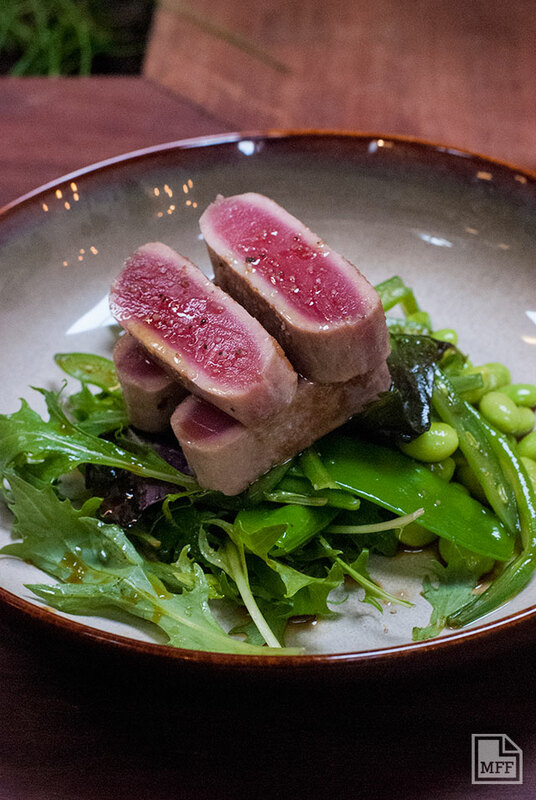 From the lunch menu, the I’ll Have What She’s Having ($18.00) is a delicate, Asian-inspired salad of seared tuna with edamame, snow peas, green beans, shiso and munzuna leaves. It’s fresh flavours make for an enjoyable light meal, but at a hefty $18.00 may leave some diners wanting more for their money. Of course being a Denis the Menace-inspired cafe kids are welcome, with a small list of items just for them. There’s also a range of sandwiches, wraps and rolls available to take away for those on the run. Don’t be fooled by the playful name: this is some serious food. The Lucas Group’s Korean slash Japanese barbeque restaurant, Kong, is arguably one of the most popular restaurants in Cremorne. The third in the group’s list of highly successful restaurants, the comparison is often made as to whether it’s as good as the group’s original venture, Chin Chin. 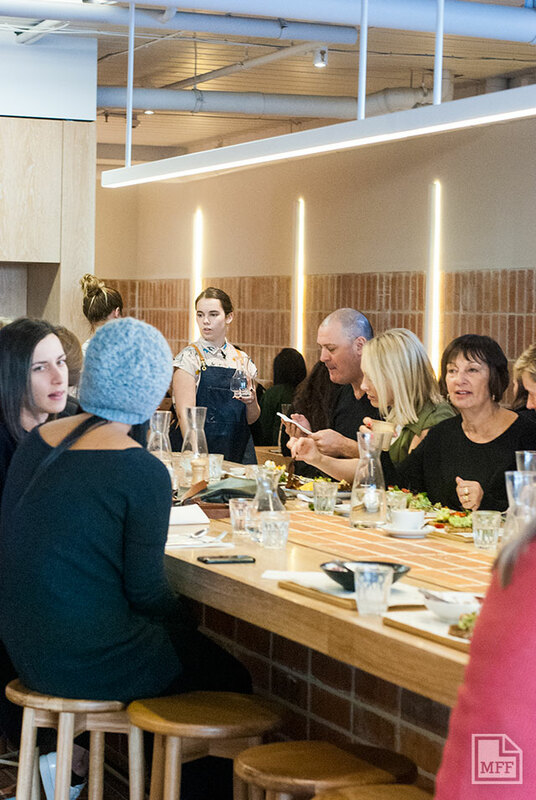 When the hugely popular Chin Chin opened in 2011, it seemed the group had stumbled onto a winning formula: great food, loud music and cheeky persona all combining to create one of the most popular restaurants in Melbourne. In 2013, the Age’s Good Food wrote an article entitled “Is this Melbourne’s Hottest restaurant?” demonstrating its immense popularity. Now, four years on, Chin Chin has seemingly kept the momentum going, with people still lining up out the door almost every night. After the success of Chin Chin, The Lucas Group opened Baby Pizza in 2012, followed by Kong in early 2014. Baby was well received, with Time Out writing “Before you ask, yes. Yes, Baby Pizza is just as busy as Chin Chin”. Kong opened in much the same fashion, but given it was another Asian restaurant from the group, comparisons began to be drawn between it and Chin Chin. So how does it stack up in comparison? Walking into the restaurant at the Swan St end of Church St, the first thing you’ll notice is how small the place is. With only 60 seats available, it is noticeably smaller than Chin Chin which seats 100, but the same cheeky persona is there: pandas illuminated on neon signs, Korean language tapes played in the bathrooms, and a giant pac man game projected on the adjacent laneway wall. The cocktail list isn’t as impressive, though they do come served in unique tall cylinders with screw top lids. 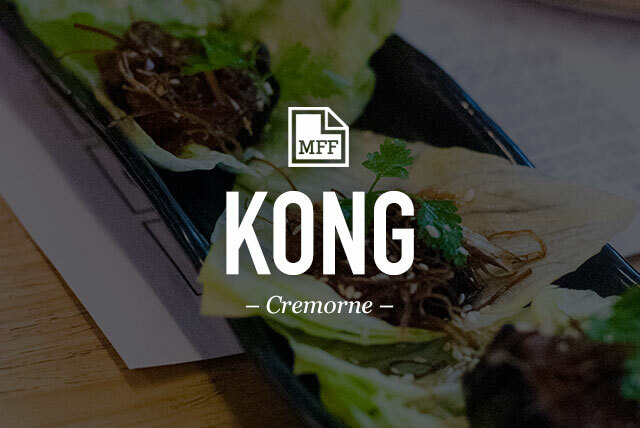 Instead of serving up South-East Asian cuisine, Kong heads north to Korea. Here, it’s all about kimchi and other accompaniments to both meat and vegetable dishes. Chef Ben Cooper is loose in his interpretation of the cuisine, borrowing on Japanese influences to round out his menu. The menu is divided up much like Chin Chin’s, starting with small items before launching into larger share plates. 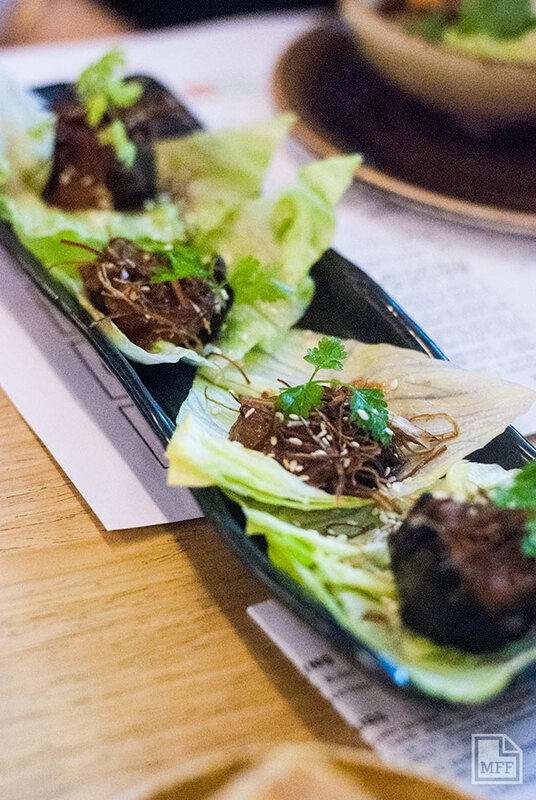 Kong’s starters include wagyu and kimchi dumplings ($18.00 for 4), grilled scallops served with tobanjan and mirin pickled radish ($18.00 for 2), and a canape version of nasu miso – miso glazed eggplant served on iceberg lettuce topped with sesame, chevril and yuzu ($14.00 for 4). The first thing you notice when they arrive at the table is how small they are. Though they are tasty morsels, there’s not much value for money here. There’s also a list of roti wraps, bao buns and chicken wings to start the meal. 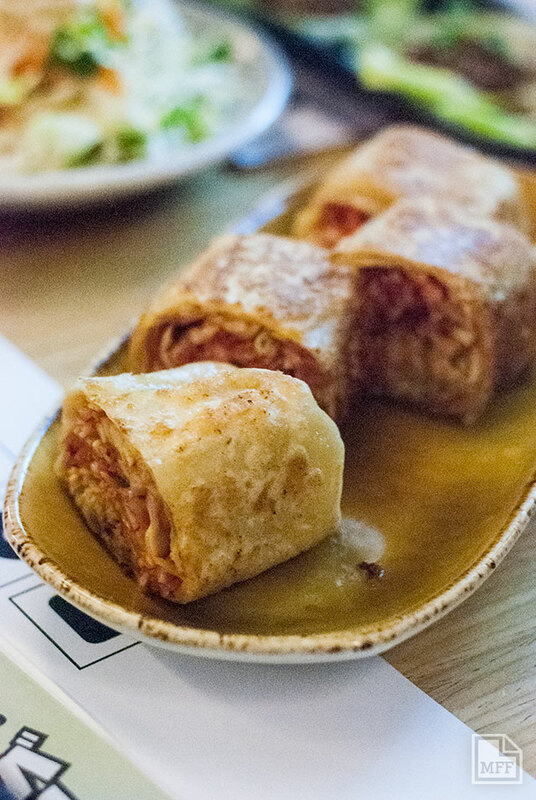 The pulled pork roti wrap is a pinwheel of pork, slaw, cabbage and burnt chilli mayo ($12.00) that goes down well with a couple of Asian beers. It’s a tasty bite but lacks the freshness associated with the Lucas Group establishments. 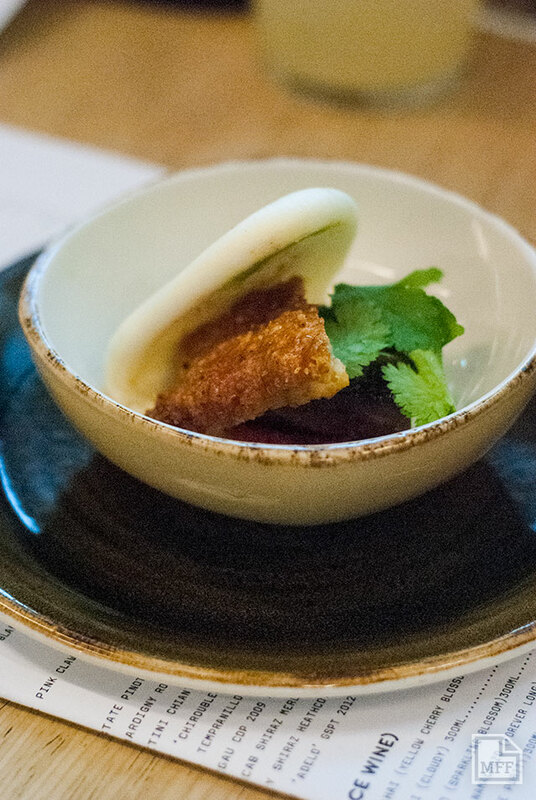 The pork belly bun with pickled cucumber and Kong’s own ‘crazy horse chilli’ ($6.00 each) might not deliver on the promised heat but again, is a tasty morsel. Like Chin Chin, the larger dishes are suited for sharing. There’s a range of BBQ meats, ribs and greens to choose from, as well as a number of rice and noodle accompaniments. 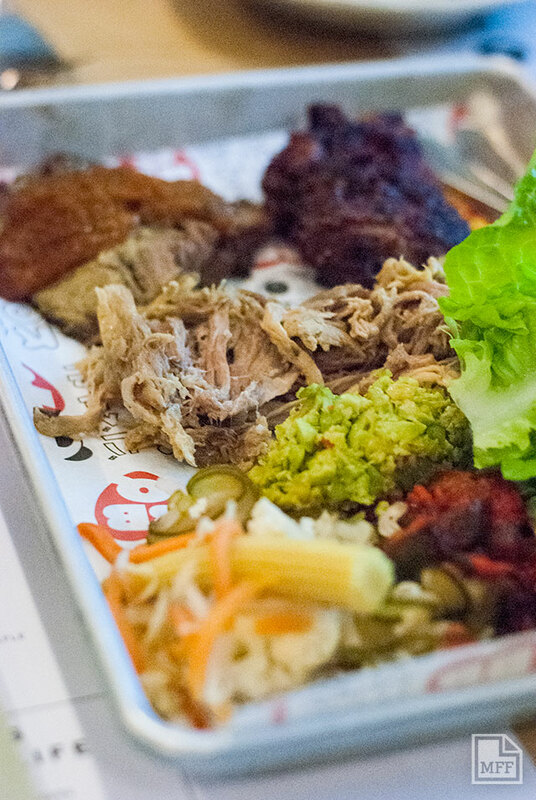 If you’re having trouble choosing, the Bossam BBQ tray ($29.00) is a great way to try a few things at once. It comes with a selection of meats, which you wrap in lettuce leaves with some pickles. Similar in style to Chin Chin’s DIY Spring Rolls, it’s fun stuff. The vegetable dishes are well-considered, with unique combinations such as the wood roasted pumpkin with edamame salsa and ramen egg ($14.00). We’ve deviated off the Korean road here, but it’s all a bit tongue in cheek here. 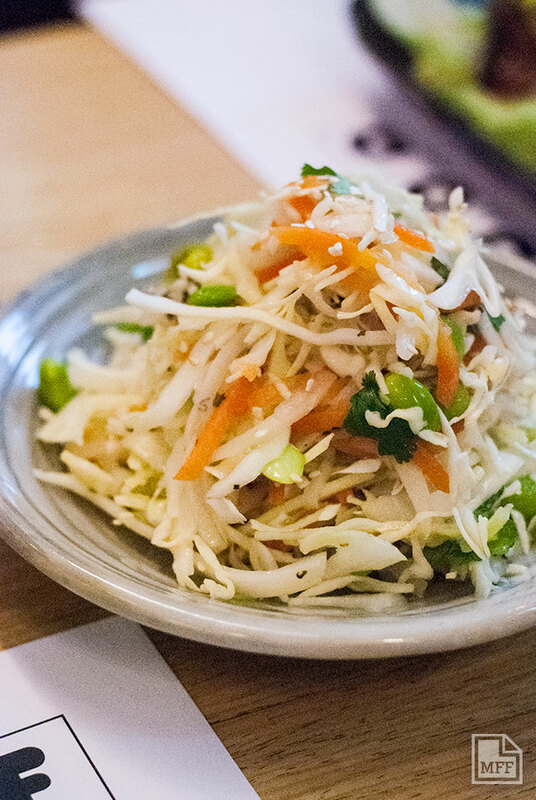 There’s a few safe options too like the spicy cabbage slaw with pickled vege, soy and yuzu ($9.00) which again lacks the promised heat. At least when Chin Chin promises some spice they deliver, Kong feels like it’s catering to the suburban masses. The dessert menu kinda feels like it’s there begrudgingly, with only two options: an apple and walnut tart served with miso butterscotch and whiskey ice cream ($13.00) and coconut sago with passionfruit and pineapple trifle ($12.00). There’s black sesame ice cream too ($11.00) but is so boring it’s almost not worth mentioning.. So what’s the verdict? While Kong hasn’t quite achieved the same intangible quality of Chin Chin, it’s still got a lot going for it. The food isn’t quite at the same level as Chin Chin so even though the larger dishes are around the same price, they seem a little pricey. And the small bites are a bit of a rip off. 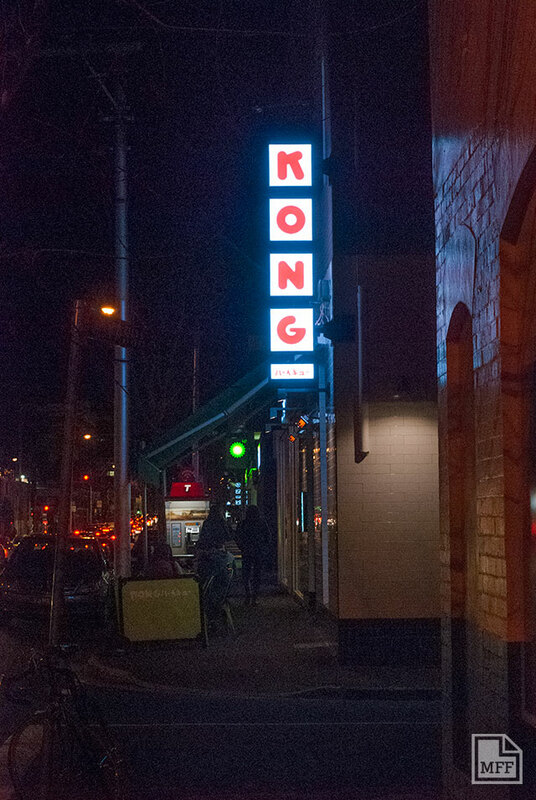 Yes, Kong has the same cheeky vibe, but the location gives it a more casual feel than it’s big brother. So while Kong might be a great place in its own right, the inescapable comparison between it and Chin Chin means it won’t ever been seen as more than it’s little brother. Down one of Melbourne’s many alleyways lies a unique culinary experience. 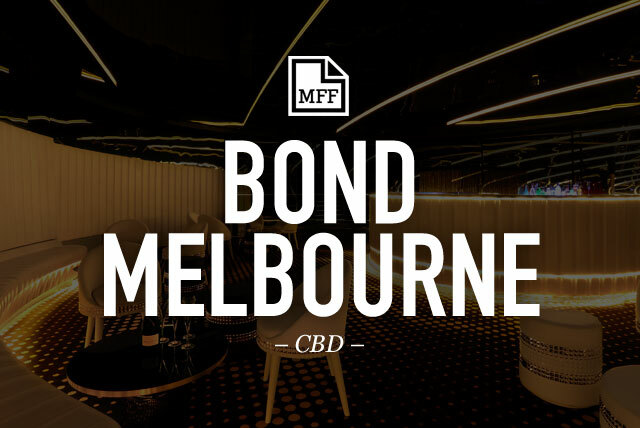 Cocktail bar, BOND Melbourne, has recently undergone a $5 million makeover and is teaming up with some of Melbourne’s best restaurants to bring you BOND’s Unwind Friday Sessions. Each Friday night, patrons will be able to enjoy some delicious finger food alongside their espresso martinis from a rotating list of restaurants. In the past, patrons have been treated finger food from places like Om Nom, Maha and Lord Cardigans, with dishes ranging from basic with a cool funky twist, to more delicate food done with finesse and fine detail. With Maha literally across the alleyway, it was obvious they would be invited to make an appearance. 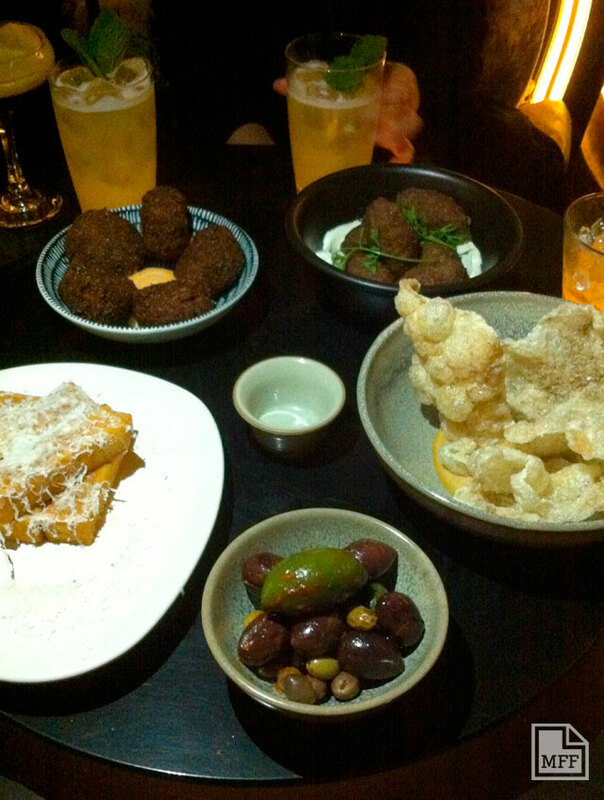 The restaurant, awarded 1 hat in this year’s Age Good Food Guide, has in the past treated BOND patrons to a virtual meze feast including felafel, kibbeh, polenta chips and pork scratching with hummus. Fitzroy’s Hammer & Tong have also been brought on board to cater exclusively for larger events. “One of Bond’s Directors is good friends with the owners and we thought it would be a good and fun project to bring them into the CBD for corporates to experience” says Commerford. Also making appearances on Friday nights, their signature soft shell crab slider has in the past stolen the show. 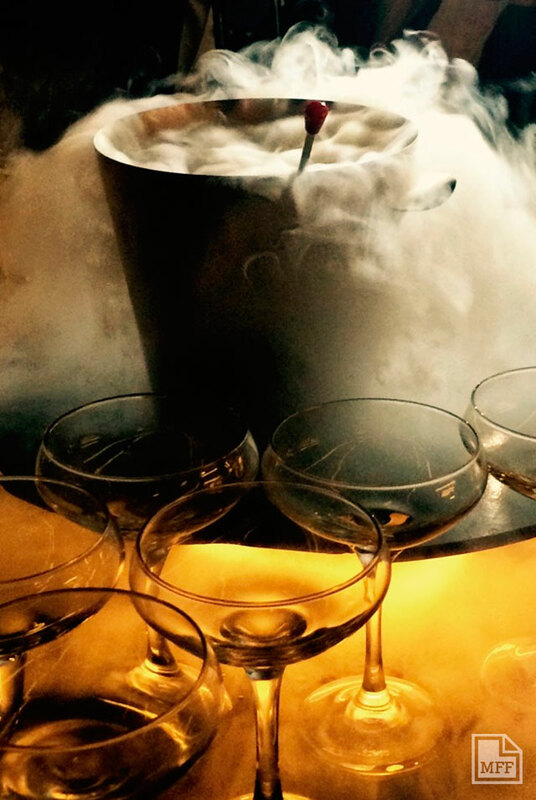 Along with the food, BOND’s mixologists are pouring some expert cocktails. At only $10 each before 10pm, they are an absolute steal. Combinations include classics such as Espresso Martinis and Amaretto Sours, as well as their own creations including my personal favourite the Lemon Meringue. And if you’re really lucky you’ll see their unique liquid nitrogen cocktailbeing made at one of their exclusive booths for a bit of theatre. You’ll enjoy these culinary delights in comfort thanks to the brilliant new fitout, courtesy of Melbourne interior design firm Hachem. BOND’s co-owner, Ozzie Kheir says the group is intent on creating a new Melbourne institution, unlike any seen before. 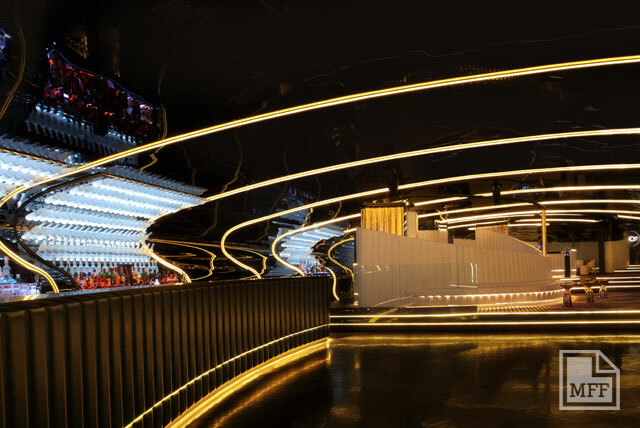 “I wanted to bring to Australia a level of luxury that hasn’t existed before with a mix of LA-style service and Dubai-style glamour – a venue with international appeal that Melburnians can be proud of” he says. While Bond’s signature curves and intimate lounge atmosphere remains, the décor has been stripped of its heavier elements, with masculine furnishings softened and the colour palette refined with an elegant golden hue. Bond’s unique interior is completely curved, from the bars and fittings, to the walls, roof and retractable curved glass door, creating a flowing space that can be opened up as one area or elegantly divided into seven private and intimate sections. Keep an eye on BOND’s Instagram and Facebook pages to find out who which restaurant will be guest starring each week.